What is ‘immersion fitness’ – and is it good for me? It was in an icy pool on Dartmoor that I found enlightenment: a sense of utter contentment, of unadulterated physical and mental wellbeing and the knowledge that, at that moment, all was well with the universe. As I lay back, chest-deep in water that even in midsummer held a breath-snatching sharpness for my sweaty limbs, I focused on shafts of brilliant sunlight breaking through the forest canopy above, and the intensity of birdsong all around. An arduous eight-mile run from Cadover Bridge up over Shell Top on uneven terrain had brought me here. Yet I felt energised rather than weary; no muscle aches or stiffness, and my feet felt light. I could have run that circuit again – probably faster. My mood soared. “Euphoric’’ is the word that proponents of a new workout – Immersion Fitness – use to describe the sensation that can be produced through a combination of hard exercise followed by exposure to cold water, and I would not disagree. An icy dip after exercise can give you a powerful sense of well being. There is little doubt that cold water has enormous benefits for the human body. There is a wealth of evidence demonstrating its anti-inflammatory and immune system stimulatory effects, mood elevation and promotion of weight loss. 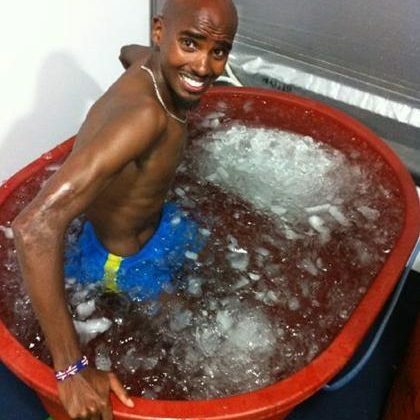 Andy Murray and the England rugby team endure ice baths as part of their recovery routine. I have always enjoyed the “runner’s high”, usually, in my case, between the fifth and seventh mile. But my experience on Dartmoor was more intense. In fact the only time I can recall a comparable feeling of such extreme wellbeing was the day when, as a teenager with a broken arm, I sat on a trolley in an A&E department watching the world go by in a blissful haze of intravenous morphine. So how can aerobic exercise and a dip in a cold river mimic the effects of a powerful opiate on my body? And could I really replicate this feeling on demand by adopting a new exercise regime? Cold-water immersion is part of the fitness philosophy of personal trainer Nigel Jenkins, the founder of Immersion Fitness. A former physical training instructor for a Commando regiment and a British international cross-country skier, he has developed a novel approach to keeping fit using the natural obstacles of Dartmoor – the hills, crags, boulders and waterways – as a rural multigym. It was Jenkins who led four of us on our challenging run followed by a leap into that pool. Later, in the Royal Oak in the village of Meavy, I traded him a pint of Otter for an explanation of his approach. Jenkins is an endurance athlete with a passion for Britain’s wild places who has run on Dartmoor for “35 years or so”. Constant, physical challenge is what he lives for. On Millennium Eve he set out at dawn to circumnavigate the moor before joining the celebrations at his local. He ran a distance of 85km as the crow flies, with 3,700m ascent, in 18hr 3min. The route has since been named “The Nigel Jenkins Round”. Jenkins explained to me that his approach was based on an understanding of the ways mankind has evolved. Humans lived as hunter-gatherers for more than two million years, with a body adapted to survive the challenges that lifestyle involved. “Our bodies are simply not designed for the 21st-century lifestyle,” Jenkins says. “We need excitement, exertion, stimulation and challenge.” His personal recipe for wellbeing is a combination of exercise and cold-water immersion in a natural environment and a “Spartan” diet, low in carbs and high in oily fish. 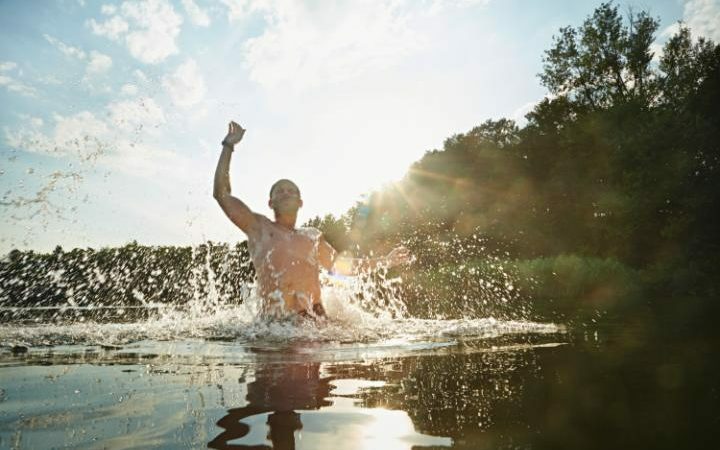 Instinct tells me that he is right, that there is synergy here – with the body’s natural response to the stress of exercise and to cold water amplified, a more profound sense of euphoria is produced. But as a medical practitioner, I want to know what the evidence is. Even a brief exposure to cold water, say 20 seconds at 40F (5C), produces a marked response in the brain with the release of a “stress chemical”, noradrenaline, which is both a neurotransmitter and a hormone. Its effect is to focus the brain and body’s attention on a perceived danger or unusual situation, while also elevating mood. A 60-minute immersion at 57F (14C) causes a five-fold increase in noradrenaline and a simultaneous two-fold jump in another chemical, dopamine. It is dopamine that generates the powerful sensation of pleasure. So as the core temperature of the body drops, the brain responds with a cocktail of hormones, neurotransmitters and endorphins to keep us functioning. It also happens to make us feel great. Last February, I took part in the Big Chill Swim in Windermere, where I met the president of a Nordic Swimming Association and asked her why anyone would cut channels in the ice of the Siberian Sea – as her members do – for the purposes of a swim. “You can run your half marathon and pound your joints to feel good, or you can achieve the same effect by swimming 25 metres in iced water…” she said. I am now convinced that by combining these activities, we reap the benefits of both and then some. A cold-water dip is now part of my daily exercise ritual. Who wouldn’t wish to feel this good every day? Cold-water immersion following exercise can be dangerous, particularly for those with cardiac health issues. Talk to your GP first and seek the advice of a suitably qualified instructor. For more details go to immersionfitness.co.uk. One-day courses £120 per person; two-day courses from £200 per person for a group of four. This article was originally written by Dr. Austin Hunt and appeared here.